We all remember our first pair of knee-high boots. We felt a little unsure if we could rock the look, but knew it was worth a try and clicked “Complete Order” without looking back. When they finally arrived and we tentatively slipped them on, we were suddenly hit with a sense of wonder. In other words, we wondered how we could have ever made it so far in life without owning a pair of knee-highs! Whether we’ve experienced this feeling or are still waiting for it, we’ve found the best pair of boots to conjure it. 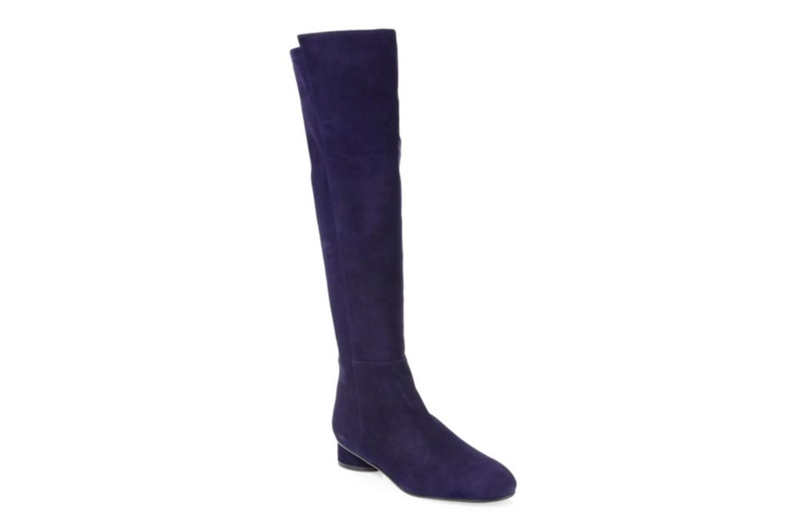 These Stuart Weitzman Eloise Suede Knee-High Boots are the best in every sense of the word. They’re fabulous in their look, feel and their price! Yes, these must-have shoes are a huge 60% off! Saks Fifth Avenue’s sale is huge and has so many great deals, but these knee-high boots are one of our favorite offerings at an insane price for this brand. Okay, wow. We need a moment. See it: Grab the Stuart Weitzman Eloise Suede Knee-High Boots (originally $765) for just $306 from Saks Fifth Avenue now! Moment over! Let’s get into details, shall we? If we were looking for just one pair of knee-high boots to be our go-tos, the Eloise Suede knee-highs would be it. Their elegant, minimalist styling makes them a sure thing when it comes to elevating our look. Whether we’re laying out our outfits for the week or rushing to put ourselves together three minutes before leaving home (the more likely scenario), we know picking out footwear won’t be an issue. Stuart Weitzman is synonymous with sophisticated style. The suede material of these boots is so soft and luxe, we can’t get enough. We love the fact that these are knee-highs because that means we get more of the suede than we would with a smaller boot! Don’t mind Us if we’re running our fingers down our shins a little too often. And don’t forget the leather sole! Classy sole, classy soul. The cherry on top is the self-covered block heel, which is 1.25 inches high. Low enough that we can wear these basically anywhere, but with just enough height to give us a little boost and pep in our step! The outside of these boots are gorgeous, but it’s important to note that the inside is special too. Beauty doesn’t have to equal pain! The padded insole ensures that we will feel as great as we look. Which is really, really great, by the way. These Stuart Weitzman shoes come in four deep, luscious shades. Black is a classic and we fully believe that everyone should own a pair of black knee-highs at any given point in their life. But we also believe in owning a variety of shades. What can we say? We’re believers. Looking for something a little lighter than black? Asphalt could be the answer. This shade is more of an off-black, with a fair amount of gray lightening it up just enough to create a distinct difference from the Black shade. Hickory steers away from black but is easily as versatile. A dark, chocolately brown, we just want to take a bite! While we can’t necessarily condone the eating of boots, especially ones as nice as these, we can definitely condone the wearing of them. Know that beautiful dark blue color the sky turns late at night when the stars are illuminating the world and we feel like nothing could ever go wrong again? That’s the color of the Midnight shade. We feel a sense of peace when we look at these. That doesn’t mean we wouldn’t wear them out for a night on the town in a mini party dress, though! Apart from a mini party dress, skinny jeans, dresses, skirts and even shorts would be excellent choices to wear with these boots as well. That covers a lot of ground, and in this case, the “ground” is our closet. We can also use the brand’s Fit Predictor to calculate our size so we don’t have to waste any time wondering if we chose correctly. There’s also free shipping! Hallelujah! Just make sure to use the code FREESHIP when checking out. Now, if you’ll excuse Us, we need to go make room on our shoe rack, because we refuse to let these beauties pass us by and we are so ready to hold them in our arms. Or wear them on our feet. Don’t judge! See it: Grab the Stuart Weitzman Eloise Suede Knee-High Boots (originally $765) for just $306 from Saks Fifth Avenue now! Not your style? Check out the rest of Saks Fifth Avenue’s amazing sale here!